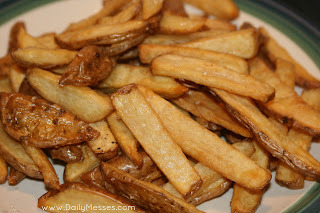 These fries are super easy and delicious! They take about 50 minutes. 2. When the oven is heated, place cookie sheet in the oven for at least 5 minutes. 3. 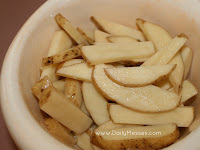 Cut potatoes into lengthwise wedges. 4. Place in a bowl and coat with oil. 5. Take sheet out of oven and pour potatoes on the cookie sheet in a single layer. 6. Bake about 40 minutes. Flip fries about halfway through. OPTIONAL: You can also toss the fries with Parmesan Cheese and parsley.